Abstract: In order to protect environment, the public go out by bus, metro, on feet and the like. Recently, environmentalists stumbled on a brand new alternative transport, i.e. Airwheel electric self-balancing scooter. In order to protect environment, the public go out by bus, metro, on feet and the like. Recently, environmentalists stumbled on a brand new alternative transport, i.e. Airwheel electric self-balancing scooter. During the industrial time, our economy gained unprecedented achievement, but at the expense of environment. These days, the public raises concerns about air and environment. The governments in a good many countries commence to approve various acts and set down an assortment of decrees to curb the pollution of environment. Now it is urgent to put the slogan-saving energy and reducing emission-into practice. We are obliged to move swiftly to fall to saving energy and reducing emission in our production and transportation. As for firms, it is essential to eliminate passé production-related procedures and techniques. As for individuals, we need to play our part in clothing, food, shelter and transportation, for no longer excessively buying clothes, saving food, water and power. When it comes to transportation, we should choose green ways, say cycling and walking. Of late, a new brand green transport, Airwheel electric scooter has emerged. 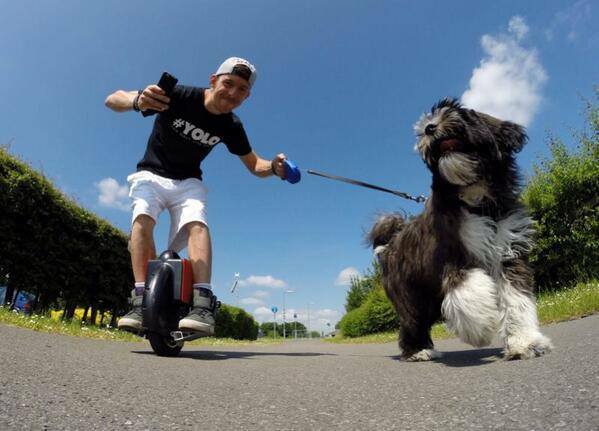 Airwheel intelligent scooter is a hi-tech product, weighing 10 kg. It is easy to carry. Its range varies between 18 km and 23 km with the weight of rider and terrain alike. Airwheel is the state-of-the-art means of transportation adopting aerospace attitude control theory, fuzzy software algorithm, and gyroscope system to maintain balance by leaning forward and backward. Riders can control the vehicle to go forward, accelerate, decelerate, and brake, etc. by leaning forward or backward. Airwheel intelligent scooter adopts Sony lithium battery core, with no exhaust emitted. Therefore it is eco-friendly.